Hungarian FM: "We have nothing to feel ashamed about"
Relations between Hungary and Ukraine deterioated after Ukraine approved an education law targeting minority languages, like Hungarian and Russian. Hungary is now blocking Ukraine's NATO ambitions until Kiev changes course. Tensions rise also because Hungary is giving passports to ethnic Hungarians living in Ukraine, challenging Ukraine law. Euronews spoke to Hungarian Foreign Minister Péter Szijjártó in Brussels. Sandor Zsiros, euronews: "When we talk about the dual citizenship in the Ukraine, actually its forbidden by the law in the Ukraine. And Hungary is still giving away passports. Is not it that you are supporting the people living there violating the law in Ukraine?" 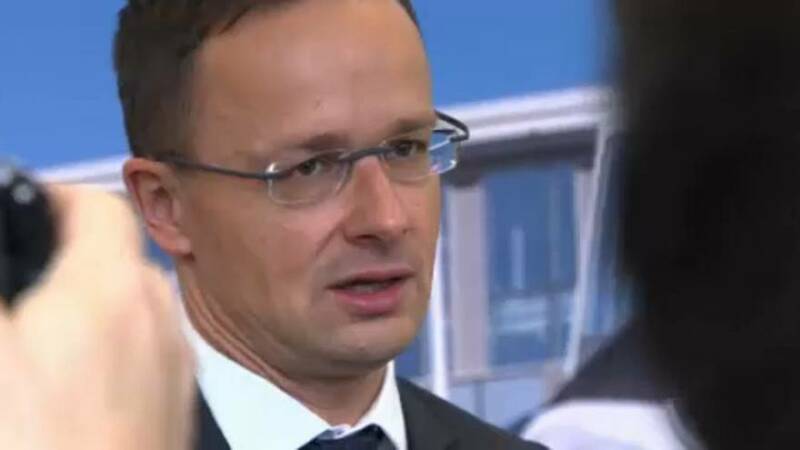 Péter Szijjártó, Hungarian Foreign minister: "Its a misunderstanding. Ukrainian law does not forbid to own the passport of another country. So when we hand out the passports for those citizens of ours who are eligible for the Hungarian citizenship according to the Hungarian legistlation, than we do not commit anything agains the Ukrainian law. Euronews: "The education law especially targets the Russian minority in the Ukraine. Di you coordinate with your Russian counterpart about how to proceed against Ukraine?" Szijjártó: "We definitely did not coordinate, because I don't really care about the Russians in this regard. I care about the Hungarians and I don't really care about who is targeted by this law. I know it has a very bad impact on the Hungarian minority. The new law on education has a very bad impact on the Hungarian minority, the new law on education takes away the right of Hungarians to have an access on exclusive education on the mother tongue." Euronews: "If some of the member states will request Hungary to change some details about the rule of law, is Hungary ready to change or will everything be as it is now?" Szijjártó: "You know we have always been ready for any kinds of discussions because we have nothing to feel ashamed about. So when it comes to rule of law issues, we are happy to discuss everything and I am pretty sure that all of our rule of law regulations are in line with the rule of law expectations of the Europen Union. So we are ready for the discussion but, you know, the reason for the discussion, the reason for the decision which launches this discussion, is not the rule of law issue, it's the migration."